Image showing a sky field in the southern constellation Hydra (The Water-snake) that includes the peculiar spiral galaxy ESO 510-13 . It resembles the famous "Sombrero" galaxy, but its equatorial dust plane is pronouncedly warped. The velocity is 3300 km/sec, the distance is about 170 million light-years and the size is 100,000 light-years. The fact that the dust band and the rest of this galaxy are not well aligned is a clear sign that the former was acquired recently (in astronomical terms). The dust band is still in the process of achieving a more stable state by becoming flat. It is not obvious how it was formed; it may for instance be the result of a merger with a gas-rich dwarf galaxy and the elliptical galaxy. In any case, this is a most interesting object that will undoubtedly soon be studied in more detail, with the VLT and other large telescopes. The photo displays a very large number of fainter objects near this galaxy. Many of these are likely to be globular clusters of stars associated with the galaxy; others are background galaxies. 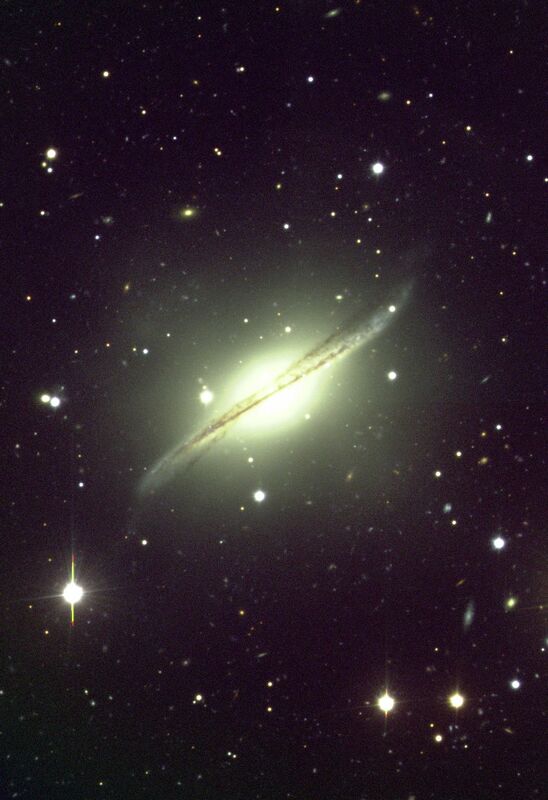 It would indeed appear that ESO 510-13 is located right in front of one or more, distant clusters of galaxies. This three-colour composite (BVI) was obtained with VLT ANTU and FORS in the morning of March 15, 1999. Field size: 6.8x6.8 arcmin 2 ; North is up and East is to the left.